It's the last Wednesday of the month and that means it is time to show off another awesome DeNami Design stamp with a blog hop! This month we are featuring the ultra versatile Leafy Squares Set. I went very clean and simple with my design for this card. Quick to create and flat to mail is always my goal at this time of year when I've got a high volume of cards to send out! I needed only three stamps, two inks, and my scoring board to complete this in under 10 minutes. In addition to the Leafy Squares set, I used the Starry Burst stamp, Whimsical Merry Christmas stamp, Satin Red Versafine ink, and Olympia Green Versafine ink from the DeNami store. Unfortunately that pretty pine-green ink looks more black in my photo. Sorry about that! I really did go for a traditional red & green Christmas color palette here ;). My very first thought about how to use this set was for a Christmas design, which I definitely ran with here, and I figured the entire rest of the team would go that route, too. Was I surprised to see the variety of ways and occasions that they used these stamps! 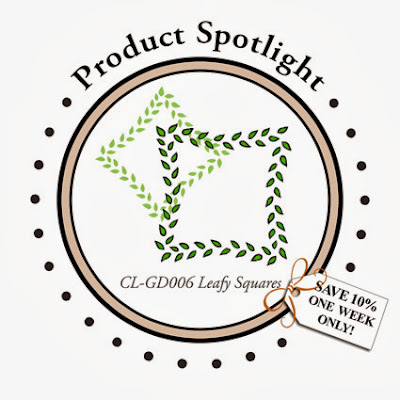 You should definitely go and take a peek at the cool things they did with these leafy squares. And what better way than with a blog hop! If you hop along with us today, I'll have a chance to win your very own Leafy Squares stamp set, so be sure to leave comments along the way. Very cute Emily! I love the star burst stamp inside the leafy square! Perfectly CAS and cute Emily!! Emily, this is so elegant and Beautifully done! I love the score lines! How cool to use these stamps for a Christmas card. I love this CAS beauty. Just so sweet and simple, Emily. I really like this stamp set more and more as I see the DT using it SO creatively in so many different ways. Awesome job. What a creative way to use this leafy frame, Emily. You have given me inspiration. I won this stamp and have had trouble finding a good way to use it. Happy Thanksgiving, and safe travels my friend! Very pretty--great how the starry burst fits in inside the leafy square. So simple, yet absolutely stunning. Thanks for the inspiration and the chance to win this sweet stamp. Loving your CAS card.. Hope you and your family had a Happy Thanksgiving. So creative, Emily! Love this perfect CAS card!